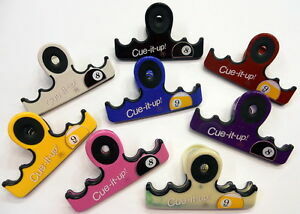 New Cue-It-Up ULTIMATE Pool Cue Holder - 6 Colors to Choose from, FREE SHIPPING! We accept PayPal. Click on link below for direct connection to PayPal. Business hours are M-F 9:30 a.m. - 5:30 p.m. and Saturday 9:30 a.m. - 3 p.m. CST. Message if you have any questions. Most item(s) ship the same or next business day. We will provide a UPS tracking number or USPS delivery confirmation number when shipped.